Recently updated Luxury four season resort. Check out the fall rates! Guests are sure to enjoy a memorable vacation in this fully furnished, 1bedroom and den, 2 bath luxurious condo. Overlooks courtyard with mountain view. Directly across from beach, close to shopping and all amenities. The main/master bedroom has a queen sized bed as does the den. Our condo is beautifully furnished to accommodate up to six people comfortably. The kitchen is well equipped to satisfy your every need including a gas BBQ on the patio. Whether it is a day on the beach or slopes, a tour of the many nearby vineyards or a round of golf at some of the spectacular golf courses we have everything you need. The resort offers excellent amenities for you to enjoy, including a swimming pool, hot tub, steam room, games & theatre room, expansive decks and outdoor terraces with BBQ centers. Stroll the boardwalks, along the beach or stop in at one of the three restaurants, Basil & Mint located in the resort, the exclusive Eldorado or the fun Smack Dab at Manteo. The Marina across the street have boat moorage, valet and will also rent water toys such as jet ski and boats. We happened upon Playa Del Sol Resort and fell in love with the fantastic vacation vibe. 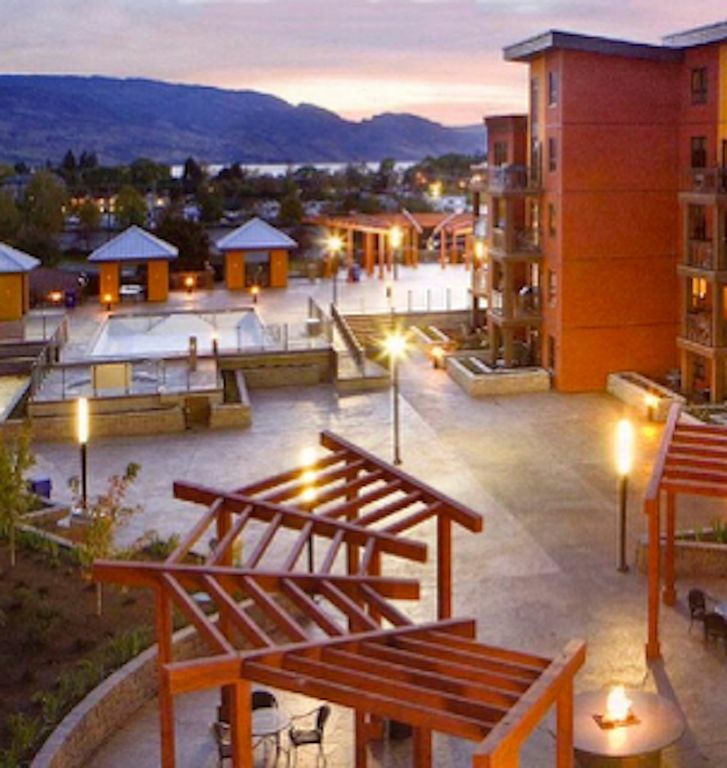 Beautiful resort facility just off the beach and close to the trendy area of lower mission Kelowna.Central to everything the Okanagan has to offer. The vineyards, golf courses and trails are right at your fingertips. Full array of Cardio equipment, weights and steamroom. Rentals available at Marina directly across street. Big White Ski Resort within 40 minutes. Various world class Golf Courses nearby. We needed to travel to Kelowna on very short notice with a couple of other family members and had the choice of booking two hotel rooms or look for an alternative more cost effective and comfortable solution. I travel extensively for work and have no choice but to stay in hotels and eat in restaurants with few healthy meal choices so a fully equipped two bedroom condo would work much better for this trip. The family members we were traveling with had little experience with VRBO but once I went through the math on overall cost, comfort and the ability to eat healthier it was an easy sell. As always the VRBO booking process was simple and our hosts Deb & Terry Vanderveen quickly responded with the trip details and local contact information and given the short notice, that was greatly appreciated. We were driving to Kelowna from Calgary and the instructions from our contact Jojo was to text her a half our before arrival and she would meet us at the condo for orientation. As promised Jojo was there and within minutes we were parked in the underground parkade and in a beautiful two bedroom condo enjoying a beverage after a long drive. The condo was perfect, spotlessly clean and with a well equipped kitchen. Unlike other condos we have stayed at the BBQ's are on the veranda so I did not have to go to a common area to cook which is a big plus. Wifi access is more than adequate and all five of us were using it simultaneously with no issues. The property is in a great location, close to the lake and Mission Creek walking trails are a block away so we were able to leave the vehicle in the garage except to hit the nearby grocery, wine and beer stores, for the duration of our stay. Leaving was just as easy and our hosts quickly sent notice that the deposit was being returned. I would highly recommend this property the location is amazing, Deb and Greg really took care of the any stress of the check-in/out process and financial transaction. Thanks for letting us stay in your place we will be back!! Thank you Neil for the kind words. We are so glad you enjoyed your stay!! Would love to see you again whenever you are in town. I enjoyed my short stay, but was disappointed the pool was outside, as I assumed there would be an inside pool, too, with the fitness room. Thanks Eric! So glad you enjoyed your stay and look forward to seeing you again!! The condo was beautiful and the location can’t be beat. It was so nice to walk into a clean and well stocked condo after a long day of travel. The hosts not only have a beautiful property they have thought of many thoughtful touches and extras that improve your stay such as pool toys, oversized beach towels and basic amenities.one of the best parts for us was that they left coffee for us! A definite bonus after a long day of travel. We were in Kelowna for a wedding and almost everyone was staying at Playa Del Sol so we got to view a it of units and I must say ours was one of the best. The unit was extremely clean and perfectly located for everything my friend and I wanted to do on our weekend away. Thank you so much Nicole! We are so glad you enjoyed your stay. Hope to see you again! Glad to hear you had a great trip! Look forward to seeing you again.